Rose and Her Lily: Week 30: Goodbye monkey baby, hello roly poly! Week 30: Goodbye monkey baby, hello roly poly! 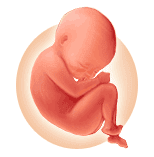 Fetal development in pregnancy week 30:fetus in seventh month The light is visible at the end of the tunnel! Your oversized self and amazing growing baby have finally reached the single digits (in terms of weeks till birth)! The fine lanugo hair that has been growing all over their little monkey-like body is going to start falling off this week in preparation for the big day. But don’t be shocked if they’re hairier than you’d anticipated, some babies keep their lanugo until after birth. Still, it’s not any cause to be concerned as it will fall off eventually. No surprises here: your little porker is getting even cuter with increasingly pudgy arms and legs this week thanks to the ever-growing layers of subcutaneous fat. In terms of numbers, your baby should be weighing in at around 3 pounds 12 ounces (or more!) and be nearly 16 inches long. And how's mom doing? On a very serious note: you should make sure to determine both you and your baby’s blood type. It’s extremely important for everyone. In the case that you and your maturing babe’s blood types don’t match there’s a chance you could produce antibodies that could potentially attack and harm a future fetus. It is rare, but with modern medicine, the problem is easily corrected and little cause for concern if dealt with properly. As for the ongoing joys of being in your third trimester: your not-so-fun symptoms are just intensifying this week, so it might not hurt to slow down a bit and focus on yourself. If you’re feeling extra fatigued, you’ve probably joined the sleeping shouldn’t be this tough when I’m this tired club, especially if you’re experiencing a lot of back pain and general discomfort. If you’ve been pushing the exercise thing, then this is the time perhaps to cut down on the physical activities and focus more on getting proper sleep (if this means buying a pregnancy pillow, then do it!). Oh and all that moodiness? Just go with the flow emotionally. This doesn't mean letting the hormones win and becoming a complete psychotic. Instead, feel the feelings, but know that the drama you’re feeling is largely a result of increased adrenaline thanks indirectly to hormonal swings—not because things really are that dramatic and merit adult temper tantrums. The clincher symptom for this week: it’s highly likely your libido has gone on sabbatical. This, as far as we’re concerned, is perfectly natural in your condition. Through the eyes of a little girl. My Love Hasn't Grown Cold.